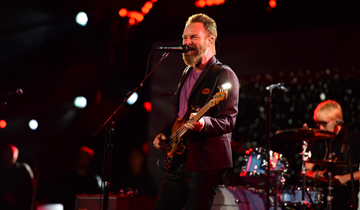 Sting had his own playbook and game strategy for his NBA All-Star Game half-time show in Toronto Sunday night. The 64-year-old who has sold more than 100 million albums would just play his hits for the 10-minute allotted slot to It’s 7.6 million viewers. Nothing crazy. No special guests. No bells and whistles, except a mighty impressive beard and special-occasion pocket square. Everything had to run like clockwork. With the West leading the East by two points (92-90) at halftime, the drum kit and percussion risers were wheeled out and dozens of lively young people were quickly led out to the foot of the stage so Sting didn't have an empty court to look at while he performed. Eastern All-Star Carmelo Anthony of the New York Knicks, a huge Sting fan, introduced him to the sold-out Air Canada Centre and the million watching on TV around the world: "Growing up as basketball players, we all dream of being legendary on the court; well tonight, right here on this stage, we have one of the best to ever do it," Anthony said. "This man has tons of hits; he has tons of soul and he knows how to rock a stage." And then he got to it. Backed by a four-piece that included two members of Texas band The Last Bandoleros, Sting then got the party started with his electronic-based Latin and Middle-Eastern flavored 1999 solo hit "Desert Rose" for which he had two midriff-bearing dancers onstage in thigh high boots. But then it was back to basics, as the girls left and he launched into a medley of Police songs. The reggae-rock classic "Message in a Bottle" elicited cheers of recognition, then they slid right into a hard rocking "Next to You" and finally the ballad "Every Breath You Take," which also received some "woos" of "I know that" and was given a lighter, gentler Valentine's Day-appropriate, less dark stalker-y take. Although the choice of Sting originally caused a bit of a hoopla (excuse the pun) when it was announced two weeks ago that he would perform over, say, Toronto Raptors ambassador Drake or any of-the-moment hip young act, the Police legend pulled it off, and it was back to the game. Earlier in the evening, Toronto-based Nelly Furtado sang the Canadian national anthem, "O Canada," accompanied by Native American flute player Tony Duncan; and Ne-Yo sang America's "Star-Spangled Banner." Furtado, who plays basketball sometimes for fun ("I'm no LeBron," she says) and calls herself a "massive" fan of the game, told Billboard, "I love living in this great country in the world-class city of Toronto. Toronto is an incredibly diverse, growing city and it means so much to be singing the anthem here in front of some of the most passionate basketball fans in the world." Although Drake didn't perform during the NBA All-Star Game, he was all over the night, introducing the All-Star players and doling out welcome hugs; to the deejay playing snippets of his music; and his OVO black and gold Raptors merch sold at the kiosks. Some concession stands even served up Hot Lime Bling, strips of boneless skinless chicken with hot sauce, lime juice and a sprinkle of shredded coconut.